Ticket to Ride uses the iPad's innovative Multi-Touch interface and large screen to provide a polished digital board game experience. Users can intuitively pick up train cards and place their trains on the board to connect distant cities, with the app automatically enforcing the proper rules, calculating the players' scores and keeping track of their Destination Tickets, train cards and remaining trains. An unparalleled online player community with tens of thousands of live opponents willing and ready to play 24/7! 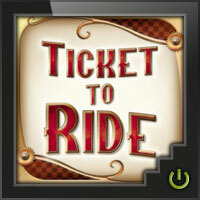 Learn how to play Ticket to Ride on your iPad! When I first bought this app, I had seen Ticket to Ride played on Tabletop, but I had never played the game myself. Since I was looking for a new app to play, I thought I’d give this one a try before buying the physical version. The app itself is nice. The interface is easy to use, has good graphics, and I didn’t experience any bugs or other issues. As always, setup (or lack thereof) is always a big plus for digital versions. Just choose your opponent(s) and tap play. You have the option to play against the bots, online, local, or pass and play. Mostly I played against the bots. I didn’t find it all that challenging or exciting. The bots complete all their actions very quickly, and sometimes their turns are so fast, you’re not sure if they just picked up train cards or destination tickets. There is just something so unsatisfying to me when playing against the bots. I guess maybe I just miss the player interaction. I tried a few games of pass and play as well, but liked those even less than the bots. When playing with another person, you cannot look at the board at all, since you would be able to see all their cards. So, you can’t look at the board and think about your future moves while they take their turn and vice versa. While they make their moves, you just sit and do nothing. I did not try any online games, but perhaps those games would be more satisfying. I finally got a copy of the physical version (10th anniversary edition, which is gorgeous!!! ), and I’ve really been enjoying it. If you like the digital version, great! If you don’t and haven’t tried the physical version, give it a chance. Just because you don’t like this version doesn’t mean you’ll feel the same way about the other. 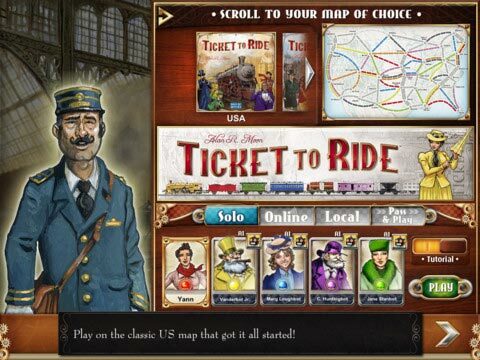 Ticket To Ride is the iPad implementation of the popular Ticket To Ride board game. It is important to point out that this is an iPad specific version and it will not run on an iPhone/iPod Touch; there is a separate iPhone version if that is your hardware of choice. Parts in italic are identical to the review of the iPhone version. Almost most reader will know the rules of Ticket To Ride, but I will still go through them. The game plays on a map (in this case of the USA) with cities and railroad routes of different length connecting them. The goal of the game is to score more points than your opponents (2-5 players total with this app). There are several ways to score points but all are based on claiming routes with your allocated 45 train tokens. A route between two cities will be of a specific color (among 8) or grey, and will have a specific length. To claim a route you will need as many train cards of the specific colors as the length of the route. For grey routes you can use any color trains, but all must be of the same color. There are also wildcard trains (locomotives) that can be used as any color. Each time you claim a route between two cities, depending on the length of the route, you get victory points (2 for length 2, 15 for length 6 for example). When you claim a route, you discard the required amount of train cards and place the required amount of train tokens on the map to show that the route has been claimed. At the beginning of the game each player will also have to choose a minimum of 2 out of 3 destination cards. Each of those represents two cities and a number of points: if at the end of the game the two cities can be linked by the routes claimed by the player, he will score the points, if not they will be deducted form his total points. The last way to score points is at the end of the game, the player with the longest continuous path will gain an additional 10 VP. During the game, for each turn, each player will be able to chose 1 out of 3 actions: claim roads on the map with his available trains cards, acquire train cards or get new destination cards (same rules as starting destination cards apply). Train cards (colored and wildcards) are randomized in a draw pile and the top 5 are revealed. When acquiring train cards, the player can either chose two colored train cards, two cards from the top of the draw pile, one colored card and one from the top of the draw pile, or one locomotive. Using the draw pile give you the chance to get locomotives while still drawing a total of two cards. The last turn of the game starts when one player has only 2 or less train tokens left. 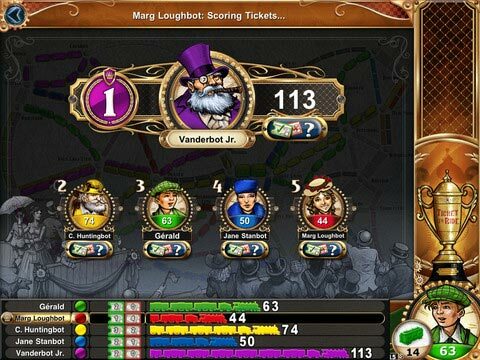 Similarly to the iPhone version, the app gives you many options to play a game of Ticket To Ride. You can play 2-5 players games. You can do so alone against multiple AI, pass and play mixing AI and human players, asynchronous online using Game Center and local wifi games. There are 4 different AI but I am not sure if they represent different levels of difficulty or different play styles. Playing against a mix of them I have won and lost games probably a similar number of times and the winning AI was not always the same. There is a handy tutorial to go through the rules of the game, and if more is needed (but I doubt it) you can also access the rules. In addition to what is available in the iPhone App, you can also play online with your Days Of Wonder account. In addition to a bigger pool of opponents (as this allows for cross platform games against PC gamers), it also allows you to play ranked games. Thanks to the addition of the Days Of Wonder online play, it is always quite easy to find a game to play, probably easier than on iPhone using Game Center only (although, as said in my iPhone review, I have not had any trouble finding opponents the few times I tried). The implementation of the game on the iPad is superb. The graphics and menu are beautifully matching the theme of the game and the user interface is intuitive: it is even easier to see what is going on on the board and even easier to play your turn than on iPhone. 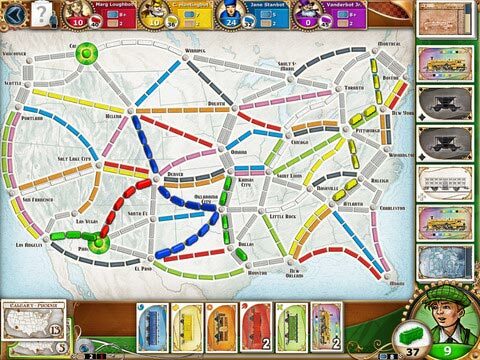 As stated in the introduction, this is an iPad only game and there is a separate iPhone version as well as an iPhone version of Ticket To Ride Europe. A short version of the verdict would be: a better app of a great game. The game Ticket To Ride is an easy to learn, difficult to master kind of game. It is easy to teach to non-gamers and although an experienced player will most likely beat a beginner, every player will still have fun. For experienced players the game can also be really strategic and interactive when they try to guess what others want to do and block them. I would put this game in the same category as Carcassonne: for beginners to advanced gamers, with more strategy and interaction as experience increases. I would however say the Ticket To Ride is little lighter. Now for the app, this is a perfect implementation; the graphics are great, the interface is easy to use and you can play in many different ways. To summarize the main differences between the iPhone and iPad implementations (except the screen size): on iPad all expansions can be bought and played within the app, while on iPhone the new map(s) require a separate app; on iPad you can connect with your Days Of Wonder account allowing ranked games and more potential opponents. I highly recommend this app to anyone; but especially for fan of the franchise. Having the possibility to link to your Days Of Wonder account and to get the expansion within the core app really makes a difference for advanced gamers. For newbies, although the iPad version is superior to the iPhone one, the added features might not be necessary and the iPhone version, being quite cheaper, can be a good introduction to the Ticket To Ride universe. This is one of the first iPad designer games I ever bought. This, for me, took my iPad to a whole different level. I had never played a euro game/ designer board game before I tried this. The object of the game is simply to use your trains to fulfill train tickets and collect points along the way. The more trains you use= the more points you get. For example to connect Dallas to Chicago along a specific route you need to draw specific train colors from the deck, match up the required number of train cards (say 3 green cards), and play those trains in the spot between 2 cities. Players build their routes as they collect the correct color trains they need. The more routes you complete the more points you get, but beware! Uncompleted routes count negatively toward you in the end and could have you finishing in last place! I really don’t understand Days of Wonder’s thought process with their Ticket to Ride apps. Almost without exception, top tier board game apps on iOS have two things in common: a slightly higher price point than the typical $1-$3 apps out there, and a universal format if possible, meaning they work on any iOS device. DoW got the high price point part down, but not the universal part. As I’m writing this if I wanted to purchase everything available it’d cost $27, and for that I get three separate apps with inexplicably varying features. On their own the apps are top notch with only very minor issues to complain about. For example on the pocket versions it’s a bit clunky reaching your online games to take a turn, but otherwise they’re fine. The iPad version is almost perfect, but is missing a feature the iPhone versions have. And possibly most annoying is the fact that not only are the iPhone apps separate from the iPad app to begin with, the US and Europe versions are, for no apparent reason whatsoever, separate apps from one other! Carcassonne is held up as the gold standard of iOS board games for good reason. If I want to play a live game against someone I can fire it up without delay. I also have the option to play asynchronous matches against other players over longer stretches of time. And both of the above can use any combination of the base game and the three expansions available so far. The developers obviously took great care to make this an excellent experience. Ticket to Ride is the exact opposite experience. If I want to play a live game on my iPhone I’m out of luck. Only async is available there. And if I want to play async games on my iPad, well, the otherwise perfect iPad app doesn’t have that option. I can do async… by installing the iPhone apps. So I click out of the beautiful iPad app to open the US iPhone app, which looks hideous in 2x mode by the way, and tap through the clunky interface to find my games and make my moves. And then I close that, open the equally ugly-at-2x Europe version and make my moves there! So very frustrating. On its own the iPad version of Ticket to Ride is a great app of a great game. I’ve played hundreds of games online, and have no plans to stop any time soon. The visuals are excellent, it’s easy to find opponents to play with, and the interface and mechanics are near perfect. It would rate 10/10 if it was universal. Maybe at least 9/10 if it included asyncronous play. As it stands it’s hard to recommend it to people looking for a top-of-the-line experience. This game should be mentioned in the same breath as the best-of-the-best iOS games like Carcassonne and Ascension, but poor decision making on the part of the publisher is holding it back. The iOS version of Ticket to Ride is the best digital board game implementation I’ve seen to date, bar none. Playing the iPad version has actually made me go back and pick up the “real” board game version again, it’s that good. Music and theme are immersive and well done. Sound and graphic effects accompany actions, such as completing a route. Scoring (something that folks manage to mess up often in my board game version) is automatic and clean. The app version offers play vs computer, pass -n- play, and online multiplayer, and a lively community never lacks for players. I once played a game on an actual moving train headed for Washington DC, playing against people in Chicago, England, and Germany—which says it all! The app also allows for post-game analysis. You can review the routes you completed (and didn’t) and also evaluate the routes of all your opponents. If you like the board game version at all, and lack the opportunity or opponents to play, I cannot recommend the app version and its expansions (of which there are several) enough. THIS is how board game apps should be done. It’s casual. Very casual. Even more casual since it’s digital and you don’t need to learn any rules. Want to play something with the Mrs. But you’re both too tired as you’ve been working all day? Click on Ticket To Ride, press “Play” and Go! Hungover from all them pints of absinthe? (Actually, you’d probably be dead if you did a pint of that…) Ticket to Ride – Digital Version! Can’t be bothered to set up a board game or have to refer to the rule-book……Ah, you get the idea! For those of you who haven’t played either the board game or this digital version, it might be an idea to go and look at some reviews for the physical version. But if you’re aware of the physical version and are contemplating purchasing this version, I would say do it. If there’s a digital version of a board game which you should have, this would be it. Easy, simple, fast (about 20 mins for 2 players!) & definitely a lot of fun! The game to play when you can’t be bothered to play a game! (Though I probably wouldn’t play with any of the random guys hovering around in the lobbies…Just save it for you and the Mrs/your imaginary friend, aka “bots”(AI). This is the greatest board game app in the history. Although a little expensive, one can invest a little bit of money for this game. Especially when the layout is nice, clear, neat and beautifully laid out. Your strategies will vary specifically depending on which of the characters you are playing. There is a few of them and they each have their own specific way of strategy. Check out my new tip for the game during the following week. I personally think that the way you put trains on the route, and look for more cards is even easier than the original board game. You can check your high-scores anytime, play online, read the rules, play with 2 to 4 people at the time, and chose your avatar photo. Well, I have not explained it yet, but the point of the game is to have the highest score by creating routes, finishing with the longest route, and completing ticket cards. Do not get too carried away with the cards though! It has additional in-app purchases so you do not get bored of it, and you will not. It is great fun. This game offers a good fun when you are on the go, it is not near confusing and totally worth the money. Go buy it today. Oh yes, and if you want to challenge me, find me: msolter1203. Now hurry up, or else you will miss your train! Well I love ticket to ride, no secret. For me one of the best games ever made. If you like the real game and want either something for two or your are to lazy to setup the real one, this is for you !!!!!! Had alot of fun playing this game w/ my family. The xbox version has awesome graphic and animations. We’ve played the board game and that was great as well, but when I showed this game to my wife we played for hours. Competing w/ each other trying to get those xbox achievements. It’s a great game. My wife is a huge Ticket to Ride (TTR) fan, so when she got an iPad, she downloaded it as soon as I told her about. She plays it constantly. I’ve played it myself, and I’m quite impressed with the iOS version. The artwork is superb, and they borrowed heavily from the game and kept it true to the theme. The interface is well thought out and easy to learn while you’re dragging trains across the screen to complete routes. You can choose between players online or various computer opponents of varying degree of difficulty. Probably the only downside is that you order expansions individually inside the game. It would be nice if they offered a special deal for buying everything at one time. For a while they had online only play, but the latest version includes solitaire play, making a great way to kill some time if you don’t want to be bothered with playing anyone else. Get it! You’ll not be disappointed. It’s one of my favorite games to play on my iPad for the simple reason that it’s easy to just “pick up and play”. On the surface the rules seem very simple, and they are, get from one place to other by collecting coloured cards and turning them into trains. Simple. Or so it seems because, you see, there’s strategy involved. You have to think about every single move, will you throw your opponent off the scent of the destinations you need to get to lest they thwart you efforts and block your path? Or perhaps you’ll be the one doing the thwarting. Great game! Love to play it all the time where ever I’m at. I love that these popular board games are lending themselves so well the to smartphone/Iphone/Ipad arena. Takes the hassel out of putting together a tabletop version of the game and finding people to play with you. Everyone has a life and things to do, and you can’t always get your group together to play a game. The games are fast and the tutorial is nice for beginners. In fact I taught myself how to play on the xbox version before I bought the board game itself. It’s much easier to learn via hands on then reading a rulebook. This is a rare moment where an electronic version of the board game keeps everything you love about playing the game, and improves by simplifying the obvious trouble of setting up the board and automating card shuffling, etc. I highly recommend this game and have it on my iPad and iPhone, oftentimes, I will hand my iPad to a friend, play 1 game of Ticket to Ride, and he’s on the app store buying his own version of it. Before I knew what happened, I could play 4 player local wifi/bluetooth games fairly easily. The only negatives are occasional crashes on my iPad (1st generation) and the online play isn’t as user friendly as the rest of the game. Love playing this game on the iPhone with friends and family, great game for people of all ages to play and with the expansions there is a lot of replay value. One downside, at least on the iPhone, are the notifications don’t always work which is a little annoying when waiting for another person to make a play. Forces one to continually check on the game, but overall a great experience. The other slight downside is that they do not currently have the european expansion available for the iphone. Would also suggest that checking out the board game would help improve the experience, games are usually better when played in person. yea, the board game takes like 2 hours since people are so slow. love the digital. quick and painless. but boring after awhile. i guess i’m not a huge fan of the ticket to ride series. Add a Review for "Ticket to Ride"